I have great friends. You know the kind. They are the ones who "get" you. That's an overused word, but it's truth. If someone doesn't see your kind of humor or share most, but not all, of your tastes, they won't understand why you think Monty Python and the Holy Grail is the best movie to feature knights and bathroom humor ever made. I engaged my friend, Patt, in a series of emails at the end of January. They started with the usual, "How's the weather?" "Awful. How's it by you?" "Rotten." She mentioned, at the time, that she was sucking on Lifesavers. She'd been given a bunch and they are a nice treat with few calories but just enough flavor to tide one over when you're between meals. I realized I hadn't had a roll of Lifesavers in my purse in years. It used to be something I always had. She's right in that the little burst of flavor can be all you need to get through the late morning or afternoon between meals. And Lifesavers can double as cough drops. I used them alot for that reason, if I didn't have cough drops in my purse. She mentioned that in her package were banana-flavored Lifesavers and they were not a flavor she liked. "I adore the other ones, just not banana." I mentioned that I really liked the banana ones. Pineapple-flavored got chucked into the garbage. I never had a roll of the tropical flavors in my purse. I usually had the 5 standard flavors or, if I could find them, wintergreen. Oh heavens. Wintergreen is my favorite, but they are so hard to find. 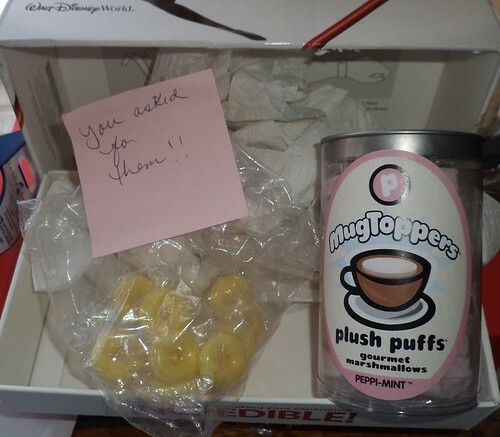 I jokingly told her I'd take her banana-flavored ones. I assumed she had a roll and not a box of Lifesavers. Fast forward to February 12th. I come home and there is a box with Disney emblems all over it. I look at this and think, "Oh Carole was smart and got something for Valentine's Day when she visited Disney World back in November." Imagine my surprise when I opened the box and saw this. It took me a minute or so to figure this out because, no, I hadn't looked at the return address label. I asked for them? What are these? They are lemon Life...oh wait a minute. I burst out laughing. It felt kind of weird because I thought when I opened the box and realized what these were, that Patt had gone through her rolls of Lifesavers picking out the banana ones. She had then just dropped them in a bag to send to me. When I opened the bag, I find that the Lifesavers are individually wrapped. You know how you'll share a lot with your friends. 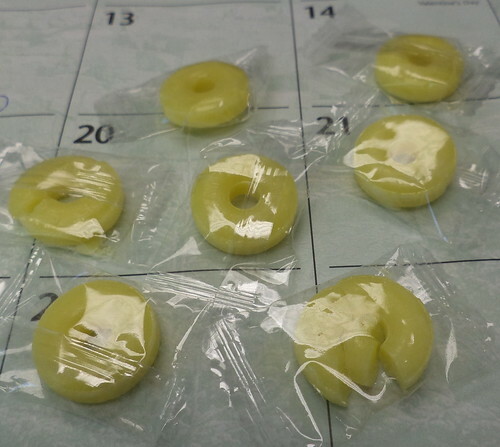 I wasn't sure I wanted to share unwrapped banana Lifesavers picked from a roll and tossed into a bag. It's one thing to have your friend point the roll at you and say, "It's a banana one. Want it?" You can see the status of the Lifesaver, but I thought, "If these are just Lifesavers in a bag, I may not eat them." This thought leads me to another thought, "When did I get so paranoid?" I trust my friends. Why would I consider tossing perfectly good Lifesavers because they weren't in wrapped packages? Hmmm...there's a blog post in that. But I digress. Patt is right. A Lifesaver at 10:30 and 3:00 eases the hunger pangs until lunch or dinner. I am so enjoying the explosion of banana flavor and I giggle every time I open one up thinking about how I got these. And, these are my Lifesavers. You get your own.